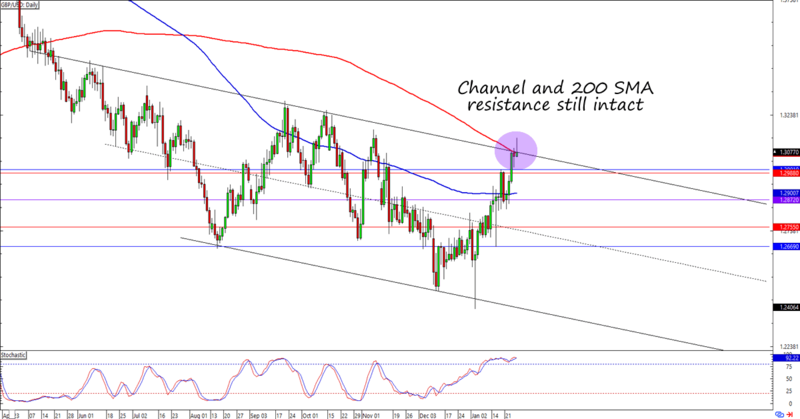 Is GBP/USD Ready to Extend Its Downtrend? Looks like the pound found fresh headlines to prop it higher today. Will the good vibes last, though? Here’s a setup for those who are looking to short Cable. In case you missed it, pound bulls found another reason to party when word got around that Northern Ireland’s Democratic Unionist Party (DUP), which helps prop up Theresa May’s minority Conservative government, privately agreed to support May’s deal in parliament IF she includes a clear time limit on the Irish backstop. But that was earlier today. The pound might have popped higher on the news, but it also lost momentum in the next couple of hours. Remember that the House of Commons will vote on alternative Brexit plans next Tuesday. Unless May gets enough support for some form of deal AND manages to get the EU gang on board, then worries over a no-deal exit might spook the markets. Heck, the Queen is already worried! On a technical basis, GBP/USD is taking a while to break above the 1.3100 mark. As you can see, the psychological level matches with a descending channel resistance. Not only that, but it’s also right around the 200 SMA on the daily time frame! As good as the setup looks, however, I’m not planning on shorting until I see some bearish momentum on the pair. For one thing, the weekly chart suggests that there could be more room for some gains before the bears really get into the downtrend. It also doesn’t look like pound bears are ready to engage just yet. Can’t really blame them after seeing the pound gain pips across the board despite an epic shutdown of May’s Brexit plan. For now, I’m gonna wait for the pair to break its 1-hour uptrend and trade below 1.2900 before I aim for the 1.2400 previous support levels. That’s it for my watchlist today! Got any ideas on how else we can trade this setup? Hey guys! If you’re watching Cable’s charts like I am, then you’ve probably noticed that it’s testing major resistance levels right now. Which way will the pound go next?